Gatifloxacin (BMS’s Tequin, Kyorin/Dainippon’s Gatiflo) was approved in the United States in December 1999 in both oral and IV formulations. The oral drug was launched in Japan in June 2002, where Kyorin is comarketing the drug with Dainippon Pharmaceutical. Gatifloxacin received regulatory approval in Germany in November 2001 but was reportedly awaiting registration in the European Union, where investigations into the compound’s risk-benefit profile were being conducted. Grunenfhal licensed the product from Kyorin for the European markets. Gatifloxacin is expected to retain patent protection in the United States through 2007 and through 2007-2012 in Japan and Europe. 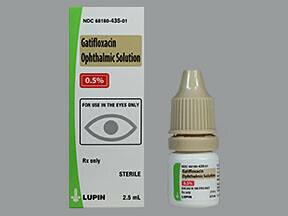 Gatifloxacin has a broad spectrum of activity similar to activity observed in other third-generation fiuoroquinolones. The agent is well absorbed following oral administration (almost 100% bioavailability), and its pharmacodynamic and pharmacokinetic properties (e.g., high volume of distribution, long elimination half-life) allow once-daily administration. Researchers have conducted several double-blind, randomized, comparative studies of gatifloxacin (400 mg, once daily) in the treatment of community-acquired pneumonia. In one Phase III trial, gatifloxacin (oral, 400 mg, once daily) was compared with clarithromycin (oral, 500 mg, twice daily) in 431 patients. Gatifloxacin showed a clinical efficacy rate of 95%; clarithromycin’s rate was 93%. In another randomized, open-label, parallel-group, multicenter study, adults with community-acquired pneumonia received 7-14 days of treatment with IV gatifloxacin (400 mg, once daily) with the step-down option, or with IV ceftriaxone (1 or 2 g, once daily [with or without erythromycin, 0.5 or 1 g once daily, or clarithromycin, 500 mg, twice daily]) with the step-down option. The study included 170 adults with community-acquired pneumonia. Cure rates at 1 to 3 days after treatment were 97.4% in the gatifloxacin group and 90.9% in the ceftriaxone group. In patients whose pathogens were isolated from pretreatment sputum cultures, bacteriologic eradication rates were 100% (gatifloxacin) and 90.9% (ceftriaxone). Treatment-related adverse events occurred in 27.1% of gatifloxacin patients and 21.2% of ceftriaxone patients. Overall efficacy rates in patients in each of the aforementioned trials have demonstrated that gatifloxacin produces cure rates similar to those of the cephalosporin ceftriaxone (with or without erythromycin), the macrolide clarithromycin, and levofloxacin. In clinical trials, gatifloxacin had a relatively low rate of adverse effects. The most commonly reported adverse effects were nausea (2.8%), headache (2.2%), and dizziness (1.3%). Other side effects, observed at lower frequencies, included gastritis, diarrhea, and rash. Like product labeling for other fiuoroquinolones, gatifloxacin’s labeling warns against giving this agent to patients with long QT syndrome. Postmarketing surveillance has found some reports of serious disturbances of glucose homeostasis in diabetic patients being treated with gatifloxacin.